Heavy snow from this weekend's nor'easter toppled a tree in Arlington, Massachusetts, on Monday, causing a bough to fall on a woman. Another nor'easter tore through New England Sunday into Monday, leaving a path of damage in its wake. 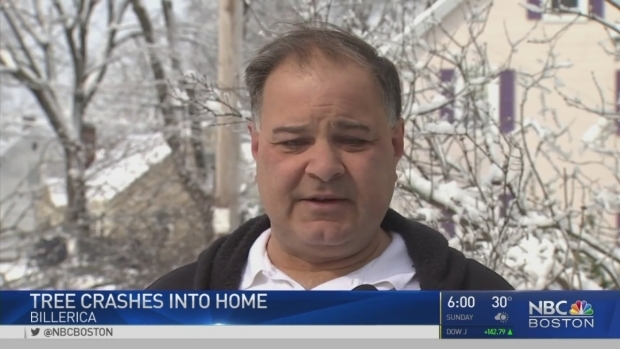 A tree hit Sharon Pacheco's house in Billerica, Massachusetts, nearly spearing her daughter. "The tree hit her room," she said. "We have holes everywhere." There's also a 10-foot long branch sticking out of the living room ceiling. Thankfully, no family members were hurt. Another nor'easter caused a tree to crash into a home in Billerica, Massachusetts, one of many instances of damage in the state. Violent winds knocked down trees in many communities. In Winchester, one snapped in two, falling on power lines in front of Rick Capobianco's house. "Everyone still has their power," Capobianco said. "I can't believe it." Capobianco's street is now littered with large branches. Another tree bough came crashing down Monday afternoon in Arlington, leaving a 29-year-old woman with head injuries. Elizabeth Beutler said her sister in law Sarah Dredge was walking with her son when the massive tree limb fell right on top of them, knocking them to the ground. "I just heard the crash and I turned around and I saw it falling and I was like, 'oh my gosh, they're all going to be dead under there,'" recalled Beutler. The family had just finished playing in the snow and were walking with two other children when it happened. The victim was hospitalized with non-life-threatening injuries. Her 3-year-old son, who was with her, was not hurt. "Sarah, my sister in law, she was crouched over my nephew, her baby to protect him," Beutler said. Many neighbors rushed in to help, including Danielle Harrell. "The first thing she said was, 'take my baby, take the baby,'" Harrell said. Arlington Police said the fallen tree limb also caused a utility pole and transformer to crash to the ground, knocking out power to the area. "We're really thankful. It's a big miracle that everyone was OK," said Beutler.